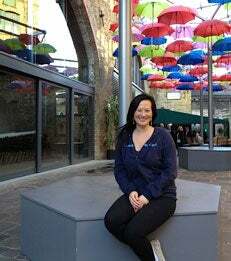 MBA student Kirsti Lee blogs from her semester abroad at London Business School. My time in London has exposed me to new cultures and approaches to life, and has better prepared me to become a global leader of tomorrow. As I approach my last few weeks in London, I reflect upon new friendships made and discoveries in-and-around London that have made this semester a special one. From day trips with fellow Sternies to exploring other countries, it has been one adventure after another. Early on in the semester, fellow Sternies, Vivek Bhat, Mario Gamez and I rented a car and headed to Bath for a day trip. The Roman Bath’s main spring was dedicated to the goddess Sulis Minerva. In Roman times, it was common for people who felt as though they’ve been wronged, to write curses on metal tablets and name suspects. These curse tablets were thrown into the spring and believed to be read by the Goddess. Over the years, archaeologists have recovered these tablets, and these are thought to be one of the most important collections found in Britain. While renting a car for day excursions is a great way to explore other cities, nothing could prepare us for the sticker shock of gas prices. In the UK, gas costs approximately $8-8.50 per gallon! Needless to say, for my next day trip, I opted for a more affordable option - the train. The next two photos are from my day trip to Oxford. The first is the front quad of my college, St. Edmund Hall (affectionately known as ‘Teddy Hall’). The lawn is as trimmed and immaculate as I can remember, and not much has changed in the facade. The second depicts the back of the college. The library is situated among graves, and to this day, I still get fairly spooked. London is an amazing city. I enjoy frequenting the weekend markets, where I have had some of my tastiest meals in London. Portobello Road market in Notting Hill is famous for its antique stalls and shops. The Camden markets cater to the punks, goths and emos. Brick Lane and Sunday Up Markets are huge flea markets where one can find novelty t-shirts and records. Borough market is replete with food stalls and artisan producers showcasing rare cheeses and home-baked bread and pastries. Food is the common theme among all these markets, and the photo below is one from the Sunday Up market. A great way to explore London is joining a walking tour. I played ‘tourist’ in London by joining University College London’s Photo Society club and was led on walks throughout the city. Below are photos of canals just behind the Camden markets. We also walked to Primrose Hill, which is located on the northern side of Regent’s Park and sits at a much higher elevation. Here you can enjoy the skyline of London. If you look closely enough, you can see the London Eye in the background. A close-up of the London Eye. A photo opportunity in front of Buckingham Palace. Artistic expression is not isolated to London museums, but is also expressed on city streets. I came across an umbrella installation around the corner from Borough market. Studying at London Business School affords you the opportunity to quickly and easily travel to other European countries. One of my most memorable trips was to Poland. The Old City in Krakow is absolutely stunning and even contains a structure for expression of speech. The Wawel Cathedral (below) sits in the confines of the Castle and exhibits architecture from many periods, namely Gothic, Renaissance and Baroque. The next photo is the train we took to Warsaw. The pristine exterior belies the condition we found on the inside (photo credit: Jimin Yoo). The next four photos are of Warsaw. The Old City was beautifully restored, and Warsaw’s castle (immediately below) is much more austere looking than Krakow’s. Sigismund’s Column (below) is one of the oldest secular monuments in Europe. Sigismund is remembered for transferring the capital of Poland from Krakow to Warsaw in the late 16th century. Travel opportunities have been highlights to the semester; however, often I did not have to travel far to celebrate other traditions. Below is a photo of the LBS Diwali party with newfound friends. As we approach the holiday season, Christmas lights brighten up Oxford Street. Red double-decker buses, black taxi cabs and fervent shoppers are common fixtures on this busy street. I conclude with a photo of London Business School. I am very thankful to Stern for its commitment to global education. My time in London has exposed me to new cultures and approaches to life, and has better prepared me to become a global leader of tomorrow.